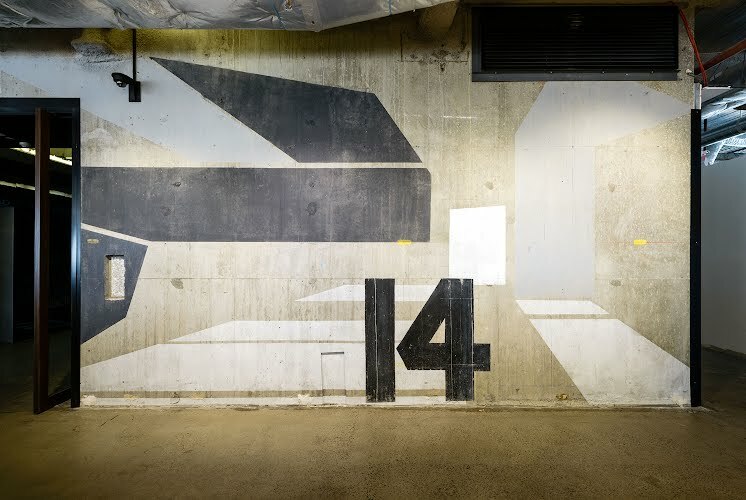 The brief for this project asked Moth to create an artwork on two exposed concrete walls at the entrance of a new workplace. The design was required to be unique to Melbourne and inspired by the Melbourne Central assets and the surrounding precinct. Moth’s intervention with these walls represents the past and the future of the space which was achieved through a manipulation of surface that will change and adapt over time. We sought to APPLY [paint], SUBTRACT [sand back] and ENHANCE [work with existing marks] in order to create a site specific artwork. A concrete stain was used to create subtle depths and textures within the surface of the wall. The markings serve to encourage movement from the lift area through to the office spaces and communal areas as well as create a talking point and something unique to set them aside from other corporate interiors.